Since the winery is going to have a Petit Verdot Vertical weekend soon, I’ve been working on creating some new recipes that utilize this amazing wine. This recipe is one of the creations I made when trying to come up with something that’s vegetarian. You could easily add some sort of protein as a topping, but I thought this was really tasty by itself. I started with the whole-wheat pizza dough recipe that you can find on my blog. If you have a pizza dough recipe you like, by all means, use that one. If you don’t want to be bothered with making your own pizza dough, feel free to stop by your favorite pizza place and ask them for some dough – many are happy to sell you enough dough for a small/medium/large pizza. I really wanted to know the nutritional analysis for the dough, so the recipe I used worked well for me. Once I stretched out the dough to the size I wanted for my pizza, I started working on my vegetarian topping. In this instance, I used Gunther’s Spicy Black Bean Dip (I had about 1/2 cup left over in my fridge), some salsa, a handful of frozen corn, some taco seasoning, and some James River Cellars’ Petit Verdot red wine. After mixing this together, I realized that I needed something to give it more volume, so I grated one small green zucchini into the salsa mixture (see the middle photo on the left). This is what I used as my base/topping for my veggie pizza. I spread it over the entire crust and then topped it with a cup of pizza cheese before popping it into a 425-degree pre-heated oven to bake. As easy as this sounds, it was just as delicious. The zucchini gave enough volume to the pizza so my dinner was very satisfying as well as being really tasty. Pizza is one of those meals where I could put almost anything on a crust and I can be happy, so this was a fun meal. If you’re getting bored with your own meal planning, try putting something unconventional on a pizza crust…. you might find that you’ve created a new favorite dinner. 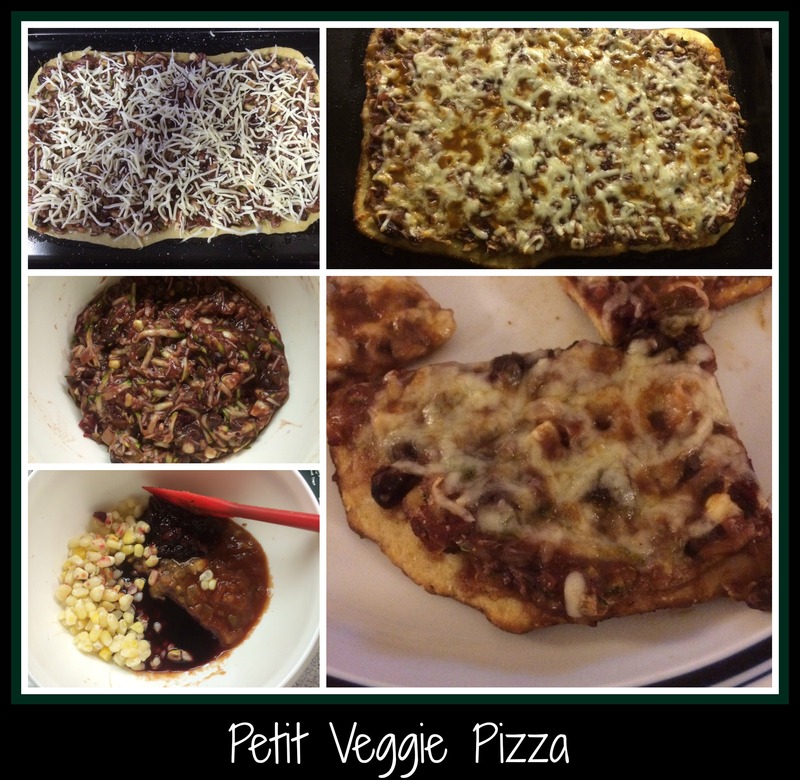 This entry was posted in Cooking, Health, Recipe, Wine and tagged Gunther's Spicy Black Bean Dip, homemade pizza dough, James River Cellars Petit Verdot, pizza, red wine, Vegetarian Recipe, veggie pizza, whole wheat pizza dough.